President Muhammadu Buhari led Vice President Yemi Osinbajo, the leadership of the National Assembly and the judiciary to lay wreaths at the National Memorial Arcade in Abuja yesterday. The event, which marked the climax of the 2019 Armed Forces Remembrance Day Celebration, started immediately after the arrival of Buhari at about 11:00 a.m. It featured a parade by officers and men of the Armed Forces and the Nigerian Legion, inspected by the president. The "Last Post" followed, a symbolic aspect of the ceremony that reminds veterans of their departed colleagues. The director, Army Chaplaincy Services, Brig-Gen. Charles Chidibere Iregu, and Navy Commander Toafeek Gidado offered Christian and Muslim prayers. After a one-minute silence for the fallen heroes, Buhari and Osinbajo laid wreaths at the tomb of the Unknown Soldier. In a departure from past tradition, the Senate President Bukola Saraki and Speaker of the House of Representatives Yakubu Dogara laid wreaths at the same time, followed by the Chief Justice of Nigeria Walter Onnoghen. During the ceremony in Imo State, Governor Rochas Okorocha donated N200,000 to a soldier who fainted. He also gave N5 million to the state chapter of Nigeria Legion. He remarked: "We are here to salute courage and patriotic devotion. We are here to celebrate heroes who decided to give up their lives that their nation might be honoured. We are here to encourage heroism in our nation. Today, we are gathered, not because these gallant men and women have fallen, not because they joined the army or armed forces, we are here because at the end of their sojourn on earth, they became heroes worthy of celebration. They gave up their lives to protect the integrity and peace of our nation." Presidential candidate of the Peoples Democratic Party (PDP), Atiku Abubakar, pledged to boost the welfare of ex-service men, if he is elected. "They deserve the best. But for them, the peace and unity we are enjoying, as Nigerians, won't be there. We owe them a lot, and their sweat should not be allowed to go unrewarded," he said during a special prayer session to mark the Day in Akure, Ondo State. Meanwhile, retired military officers in Kano used the occasion to demand the implementation of the Revised Gross Consolidated Armed Forces Salary Scale (CONAFSS). The spokesman of Retired Army, Navy and Air force Officers (RANAO), Captain Yusuf Abdulmaliq, accused the Ministry of Defence and Military Pension Board of deliberately ignoring the implementation after Buhari approved it on November 9, 2017. He regretted that some retired soldiers were facing hardship after 35 years of sacrifice to the fatherland. He also appealed for the quick passage of a bill seeking to amend the act that established the Nigerian Legion. He said when passed into law, the bill would ensure improved welfare and unify various associations of retired soldiers. Abdulmaliq, who claimed the Legion has outlived its relevance, said the decades-old association established by the British is not able to resolve challenges faced by retired soldiers. According to him, "The Nigeria Legion is weak and infective. It can no longer work for the universal interest of retired soldiers. The leadership is compromised and can no longer be trusted. We have had monumental fraud especially on the yearly armed forces remembrance emblem. Where are the millions of naira being donated? Can they account for all this money, because we don't know where they are spending it? 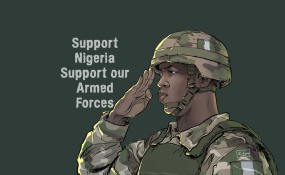 When you go to states, you will find relatives of retired soldiers suffering without assistance from the Nigerian Legion." This was as Kano State Governor Abdullahi Ganduje commended the Nigerian Army and other security agencies for curtailing the activities of insurgents and other criminals in the country. "We must always give honour to whom it is due. Today, we are honouring our fallen heroes who laid down their lives for peace and unity of the nation. We are remembering them today as heroes because they made the utmost sacrifice in the service of humanity," Ganduje added after laying the wreath.